Free Showcase Show Set For March 12 at Barracuda in Austin. 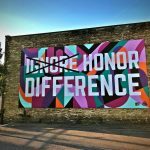 Station commissioned Milwaukee artists to design two murals this year to enliven neighborhoods and spark community conversations. Two colorful, original murals aimed at spurring community conversations will be created by Milwaukee artists on large blank building walls in the Near West Side and Walker’s Point neighborhoods, as a result of an 88Nine Radio Milwaukee (88.9 WYMS-FM) initiative announced Friday.